Lower Levels of Fluoride in Drinking Water on the Way? Time for an update about fluoride in drinking water from two different government organizations… The U.S. Department of Health and Human Services and the U.S. Environmental Protection Agency. Therefore, if you have concerns about fluoride in your drinking water, you may want to keep tabs on what happens after this announcement. Government agencies considering lowering recommended level of fluoride from the range of 0.7 to 1.2 mg/L down to 0.7 mg/L. Maximum level allowed in drinking water may also get reduced by the EPA. Americans now exposed to fluoride from numerous sources. 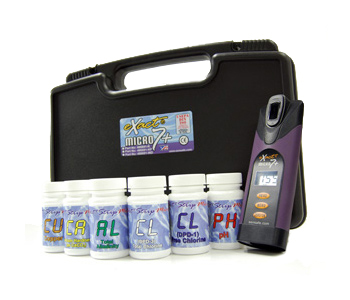 The eXact Micro 7+ water testing meter can test for fluoride levels between 0.1 and 1.1 mg/L (ppm) using proven SPADNS chemistry. Recently the U.S. Department of Health and Human Services and the U.S. Environmental Protection Agency stated publicly that they will soon recommend lowering the maximum amount of fluoride allowed in water to a level that will still give citizens the benefits of reduced tooth decay while hopefully preventing excess exposure to fluoride. Current guidelines place the maximum allowable levels of fluoride between 0.7 and 1.2 milligrams per liter (mg/L or ppm) and the new recommendation would place that limit at 0.7 milligrams per liter. Why the alleged need for guideline reform and upper limit reduction? Quite simply, the world has changed and no longer do Americans get their dose of fluoride from only one source. The quote below goes into more detail on that point. Will changes, if they occur as a result of these recommendations, have any effect on the lives of most people? No, not really. We will all most likely go on with our lives completely oblivious to the reduction in fluoride levels in our drinking water. That does not mean, however, that some folks will stop their efforts to get all fluoride removed from drinking water. A certain element exists in our society that despises fluoride in all its forms and wants it vanquished from public water supplies altogether. Fluoride reduction in drinking water? 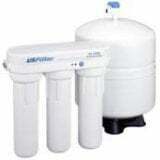 If government agencies won’t mandate the removal and/or reduction of fluoride levels in drinking water, and people still want it, home water filters for fluoride reduction do certainly exist. Note that we said fluoride reduction and not fluoride removal. To our knowledge no water filtration units commonly available to the general public will remove all fluoride from drinking water. Quality water filtration units will, however, bear certification to reduction standards established by organizations such as the NSF, an independent testing organization involved in many areas of quality and safety dealing with consumer goods. As an example, NSF Standard 58 deals directly with the reduction of specific drinking water contaminants. See below. Want an example of an affordable reverse osmosis system that has tested and certified to NSF Standard 58, the Pentek RO-3500 Monitored Reverse Osmosis System reduces for TDS, Fluoride, Turbidity, Lead, Nitrate, Selenium, Arsenic, Copper, Cadmium, Barium, Cyst, and Radium… and has a price tag under 270 dollars. With all of the recent publicity that chromium has gotten as a result of EWG Reports Finding Chromium in Municipal Water Systems, we figured some of you might want to know a bit more about the health effects of chromium, where chromium comes from, how to test for chromium in drinking water, and most importantly… how to get rid of chromium if detected in one’s drinking water. Chromium will appear in nature in one of three forms: Chromium(0), Chromium(III) or Chromium(VI). Chromium(0) gets used in the production of steel. Chromium(III) and/or Chromium(VI) may appear in compounds used for chrome plating, making dyes and pigments, tanning leather, and preserving wood. Chromium(III) aids the human body in its use of sugar, protein and fat, though health officials suggest not using excessive amounts of dietary supplements containing chromium compounds. Higher levels of chromium(VI) may cause irritation to the lining of the nose, ulcers in the nose, runny nose, and other breathing problems such as asthma, coughing, shortness of breath, and/or wheezing. While both Chromium(III) and Chromium(VI) in air can cause the aforementioned problems, effects occur at much lower concentrations of Chromium(VI) than Chromium(III). Chromium(III) and Chromium(VI) may exist in drinking water and have no associated tastes or odors. If ingested, Chromium(III) compounds tend to have less toxic tendencies and appear to cause fewer health problems than Chromium(VI) which causes anemia, irritation of the stomach, ulcers in the stomach, and ulcers in the small intestine. Some laboratory animals exposed to Chromium(VI) experienced sperm damage and damage to the male reproductive system. Some Chromium(VI) compounds may cause skin ulcers and a percentage of the population have extreme sensitivity to Chromium(VI) and/or Chromium(III) with allergic reactions manifesting themselves as severe redness and swelling of the skin. Regulations, rules and recommendations pertaining to Chromium? What NSF/ANSI Standards apply to chromium in drinking water? Standard 53, Standard 58, and Standard 62. For more information on the specifics of those NSF/ANSI Standards and others, take a look at the NSF International Web Site. 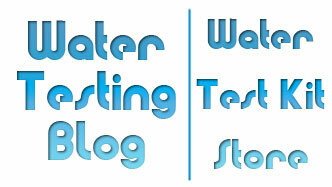 It offers a wealth of information for both the consumer AND water professionals alike. Removing chromium from drinking water? As far as units for the average consumer, pretty much only reverse osmosis makes any sense. One could use a process like distillation, but it has a flow rate that most likely would not meet homeowner needs and a much higher entry cost. As an example of a reverse osmosis that carries NSF Certification for chromium reduction, you may want to take a look at the Pentek RO-3500 which has a price tag of under $270 and appears to offer a lot of filtering power for the money. 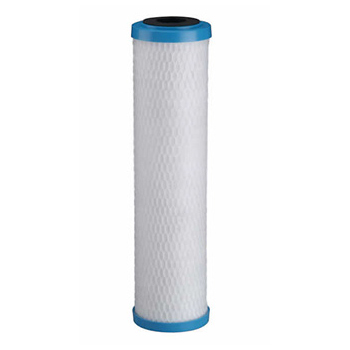 Pentek RO-3500 Reverse Osmosis Water Filters have tested and certified to NSF/ANSI Standard 58 for the reduction of Pentavalent Arsenic (Arsenic V), Barium, Cadmium, Copper, Hexavalent & Trivalent Chromium (Chromium VI & Chromium III), Cyst, Fluoride, Lead, Nitrate/Nitrite, Radium 226/228, Selenium, TDS and Turbidity. 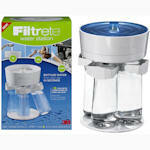 Does Filtrete Water Station Remove/Reduce Fluoride? We received a very direct question from ‘HonestJr’ about a product we wrote about recently: The Filtrete Water Station manufactured by 3M. Thank you for your question, Honestjr. As best we can tell from the information available online, the Filtrete system does NOT remove fluoride — but we suspected that even before beginning research. Simple water filtration units will most often remove (or more likely reduce) chlorine levels to improve taste and odor of water — and not really do a whole lot more. 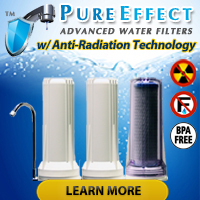 Reducing/removing fluoride requires technologies beyond simple GAC (granular activated carbon) filtration devices. If you have serious concerns over fluoride in your drinking water you may want to consider taking a look at the following pages from our site, as they give more information about removing fluoride from drinking water. We hope this helps. If not, please feel free to write back and we’ll do what we can to provide additional information!